Detrended Price Oscillator (DPO) is an indicator for eliminating trends in prices. DPO allows to more easily identify cycles and, based on that, overbought/oversold levels. Detrended Price Oscillator (DPO) indicator is used to isolate short-term cycles, from long-term cycles. By eliminating long term trends, DPO helps to focus on shorter price moves/cycles, thus again making it easier to spot an overbought/oversold level. How DPO indicator does it? Detrended Price Oscillator compares closing price to a prior moving average, eliminating all cycles that are longer than the moving average. Standard DPO indicator setting is 20-period. The indicator oscillates around zero level, and, if to take 20-day DPO, it'll remove cycles longer than 20 days. Identify a trend and trade in the direction of the main trend. Buy when DPO hits zero from above or dips below zero for a while and then goes up above zero. Sell when DPO hits zero level from below or even crosses above zero for a while and then turns back below zero. 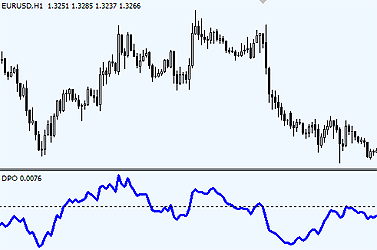 Identify overbought and oversold levels individual for every currency pair based on the past price behavior. Buy after DPO dips below an oversold zone and then exits from it closing above the oversold zone. Sell after Detrended Price Oscillator enters an overbought zone and then exits from it and closes below the overbought zone. similar to this, DPO signals short trades when it crosses below the zero line. 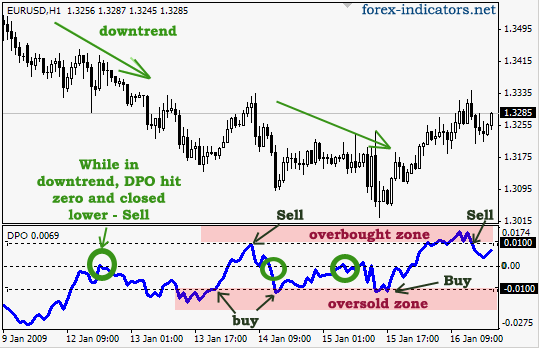 Additional strategy is to look for a divergence between DPO indicator and price on the chart. When indicator makes a higher low and price at the same time makes a lower low - we have a bullish divergence. When DPO makes a lower high and price makes a higher high - it is a bearish divergence. You're talking about the same indicator. No difference. Another great explanation with a very powerful indicator! Overbought & oversold are somewhat subjective so I added a 13 LWMA signal to the DPO 13. Now I watch for earlier of the crossing of the signal or the zero line. Absolutely fantastic! Thank you very much! The two indicators above are NOT identical from a source code standpoint. The Dinapoli is hardcoded to use 7 in the moving average calculation and does not shift the indicator.